Ever had a quilt that everything went wrong from the beginning? Thread: Ever had a quilt that everything went wrong from the beginning? I planned a quilt for my hubby. Everything went wrong from the first cut. I forgot to take into account the 1 inch strips that I used to frame each square. So, of course that meant that nothing was matching or evening out from that point on. Well, I thought I would just cut each block square knowing I would loose fabric. 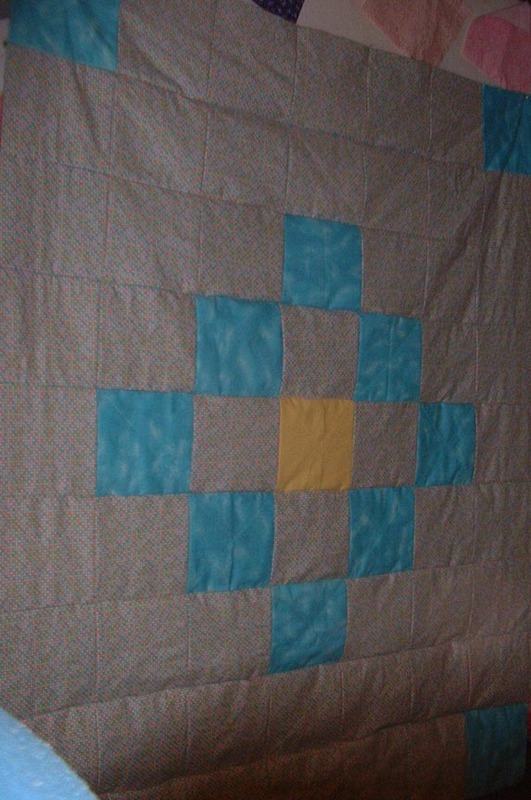 I got the blocks together and the top finished, then I sandwiched and began to quilt. After I had quilted around each block (in the black 1 inch strips) I laid the quilt down to trim around the ends and discovered the batting was crooked and so was the backing. I just trimmed anyway and instead of making a binding I am just going to use the large sashing and fold over. I really do not like this one and have found mistakes all over it....like a nick in the fabric when I trimmed a thread too close (you can't tell it unless you know it is there - like me). I will have it finished by Father's Day and I know he will love it, but I feel really bad that out of 5 quilts I have completed so far this one is by far the worst of the lot! Anybody else ever had this type of situation and what did you do? Don't ask for pictures as I would really feel embarrassed to show this work to such an esteemed group of quilters as you all!!! Oh boy, that reminds me of the last baby quilt I made. Too painful to talk about - and I have made loads of quilts. Don' t feel bad. Sounds like he will love it anyway. Yes, I have had that happen also. Sometimes things just work out that way. It will probably make you more careful on your next quilt, as every quilt is a new learning experience. When you finish it, just forget all the problems it caused you, and be glad it is finished!! Then start your next quilt...it will make you feel better. I have only been quilting 3 years, and I have had things go wrong all the time. Usually I think "What were you thinking....didn't you check what you were doing before you did it!!!!" I was making a baby quilt for my DGD and was using the pinwheel pattern I love to make. For some reason the points just would not match no matter what I did. My DD had ask for dragon fly fabric which I had not been able to find, I went to the store and found pretty iron on dragonfly's and put in the center of each pinwheel and sewed them down for extra hold. It turned out so cute and they loved it. So what started out as a bad headache turned out good. Never was there a truer saying than, "Better to be finished than perfect", lol! Try and put the mistakes down to that big learning curve we're all on. Think positively about what (hopefully) you'll never do again. BTW - this advice is from someone who the other day broke a needle switching from straight stitch to zig-zag without changing the foot. I put in a new needle, threaded it up - and did exactly the same AGAIN! (I went for gold on the second attempt, as I actually managed to take a piece out of the plastic foot ). Your husband will love it - just as he loves you. I started a rag quilt baby size for charity over 10 years ago. Since I am in the process of packing for a move, I tried to give these blocks away to my local friends but NO ONE wanted them. So I said HOW hard can it be to finish?? It didn't take me long to figure out WHY I had stopped: I was short of the flannel for the back. So after a couple of days on my design wall, I made a pattern on the back using some of the turquoise to make it look like this is what I had planned all along. STILL SHORT 1 bloody piece!! So I used one of the extra yellow square for the back and I can now say at least it is done and no one except for you will know the error...... Going to be a donation to the devastated area in Oklahoma. My family roots are from that is also in tornado alley. Please remember there are NO quilt police. We have ALL made errors so no one can actually point a finger at your quilt. Your husband is going to love it no matter what because it is a gift from the heart. And really, that is ALL that really counts!! RIGHT??? I wont say, I've had a complete quilt go wrong. What is a disappointment is when cutting all of the pieces for a quilt out. And either the triangles, are too small, or the sq's are too small, or something. Or the measurements are wrong, or directions. I'm working on some blocks for my long arm lady friend. I cut out sq's-3 5/8''..192 to be exact. I had to recut them to 3 3/4". And I even used the templates in back of the book. yep. just finished one. A wedding quilt. I said if I believed in curses, I'd know someone put a curse on it. Just so glad it done, delivered and out of my sight. Yep, I became so angry at one quilt I took out side cut it into small pieces and set it on fire....No I don't have a temper..
Everyone has a horror story I am sure. We are our own worst enemies. If he loves it just sit back and enjoy his joy. Oh yes!!!! Butterfly blocks - wings on backwards - nothing would match up!! Still haven't finished it - but it just needs quilted. I will be so glad to get this one done!!!! I'm sure hubby will love his quilt. You know, I think when most of us ask to see pictures of quilts here, we are really more interested in colors and patterns than than perfection and skill. OH YES!!! my nightmare quilt was a gift for my new mother-in-law...(of course) everything went wrong- it was an embroidered lone star quilt and even though the embroidered sections on their own are beautiful the lone star sections were *wonky*- nothing went together right...it puffed in places...it is anything but square & flat- and was a nightmare to quilt- but I did get it done & even though I hate it and cringe at the thought of it- hate the thought of her showing it to anyone- she loves it...so, I guess that's what counts. someday I want to make another one like it- and maybe get it right-but that one...OMG what a stressful mess it was= and a Christmas gift...ugh- worst quilt I ever made...I've had a few that didn't turn out quite the way I expected- but that one everything went wrong. I firmly believe that some quilts simply aren't meant to be. Wrong pattern, wrong set of fabrics, and nothing goes right from start to finish. I have one that I started as a new quilter years and years ago.....I had just discovered strip piecing and rotary cutters had just come on the market. Nowhere in the pattern did it warn against using directional fabric!!! I swear it didn't!!!!! So I have a huge set of blocks with the bright multicolor fish swimming up and down......and with the lovely orange blender fabric I chose, the black background with the fish makes it look like a Halloween nightmare...... I keep thinking I'll figure out a way to salvage it but maybe next year! Yup...even called it "Murphy's Law" because whatever could go wrong did! It was supposed to be a Millennium quilt, for a guild challenge, with 2000 - 1" squares. Hah! More like 2300+ "non-square" squares. Tied, not quilted (as challenge rules stated it had to be), binding didn't quite attach to borders in some places...you get the drift. NOT a perfect quilt by any means. I did display it at a quilt show with the attached note: "If I can display a quilt like this, you should never feel intimidated, so show your quilts. Remember, there is no such thing as the quilt police!" Didn't win a ribbon, but did get lots of laughs and nods. It is now, one of my favorite quilts. It will forever be "Murphy's Law". That is always very discouraging. I never cut the fabrics for the entire quilt at the beginning. I cut what I need for the blocks/center. Then measure and cut whatever borders I want, then measure and cut for the binding. Sometimes I change my mind in the middle of a project and do my own thing so this works best for me. Sounds like the Garden Twist I made a few years ago. I got extra fabric to make it larger then either cut wrong or the pattern was wrong because I really messed up. I finally "pieced" some of the piecing to make enough blocks and figured it was going to be a horrid mess. It ended up that you can't even tell where I added creative flair to the design. LOL My longarmer did a fabulous job and now it is on our bed. I frequently get lavish praise when people see it, so I just keep my mouth shut and say thank you. I bought a kit to make a lap quilt for my best friend, she helped me pick out the fabrics without knowing it was for her. I knew it was an easy quilt to make so I started gung ho making it. After I had made all these HST and Flying Geese, I realized I did it wrong ! Even today, 3 years later, I still don't know what was going through my mind. I just put all the fabric and finished pieces into a ziplock bag and there they sit. I will get around to working on it again, but now I need to redo the pattern as it is totally wrong. I should have sewed the whole thing in one day, but now it will take me days to get it together !!! Don't feel bad, it happens to all of us.